One of my all time favorite books is one I picked up while I was a design student. I have always been fascinated with looking at buildings and interiors and I always want to know more about them. 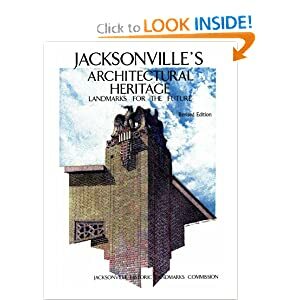 Well if you feel the same way I encourage all of you to pick up a copy of Jacksonville’s Architectural Heritage – Landmarks for the Future which was created by the Jacksonville Historic Preservation Commission. 2 Responses to "Local Design – The Importance of Knowing your City"
Yes! This Historic Preservation site was also used in the Design Concept class when the student’s need to use a historical style as their inspiration for a condo design located in Riverside. Stephanie that is great! It popped in my head to share this book because it is one of my favorites. I am planning to create some posts about some of the architecture/architects here in town. I am sure Klutho will be first because his work is so identifiable and the students can still view it.